The following article was first published in Gallop magazine, April 2011. Picture this. You’re with a group of two other riders, ambling along a country lane, chatting. Suddenly, a pheasant flies up from the hedge and spooks your friend’s young horse. She falls heavily into the road, and now there’s a car coming. Would you know what to do? Jane, a senior paramedic and trainer, and her colleague, Neil Rooney, a member of the Hazardous Response Team, outlined a number of practical first aid measures during a talk on First Aid for Horse Riders at the Cheshire Horsey Coffee Morning in Mollington, Chester. “The first thing that you need to be aware of is your own personal safety,” said Neil. “If you are injured yourself, you can’t help anyone else and the situation is suddenly twice as bad. Control the loose horse if possible, and station the third rider or any bystanders on traffic watch, especially if the injured person is lying in the roadway. One rider needs to take control of the situation, and delegate tasks to others. Once the situation is under control, then examine the casualty. Is the person conscious? If so, then obviously it’s a good sign. Try to discourage them from sitting up too quickly, and ask them about any neck or back pain. Consider as well if you are going to need any other emergency services, such as the police (if the road needs blocking), the fire service (if the horse is trapped), or the vet. A – Airway Management. If the rider has fallen on their back, they may be in danger of a blocked airway. Gently hook your finger under their chin, and pull up on the chin to lengthen the area around the bottom jaw, which is a simple and safe way to remove the soft tissues in the mouth from the airway without moving the patient. You may need to keep the airway open in this way until help arrives. B – Breathing. Is the casualty breathing? Listen for ten seconds. If you can’t hear a breath in that time, call the ambulance service immediately, and ask for their instructions. C – Circulation. Any major bleeding needs to be stopped as soon as possible. Apply direct pressure with your hand or a pad of clothing, or indirect pressure on an artery. If possible, elevate the limb to slow down bleeding. After Neil’s talk, it was time for the group to get some hands-on practice, applying bandages and slings to imaginary injuries, and assessing group members who’d had nasty falls from their hobby horses! “Remember,’ cautioned Jane, ‘that if you have any suspicion of a neck or back injury, you should not apply a sling, which fastens at the back of the neck and may put pressure on an injury. A broken wrist may not be serious, but an aggravated spinal injury will be! Signs of a neck injury include problems moving the legs, pain or numbness. If you are out riding in a rural area, it may be some time before the ambulance can get to you, and you must give them clear instructions, or they may never find you. Try to get help at a nearby house, and get a postcode for use with satellite navigation. Passing drivers may have satellite navigation in their cars, and be able to supply details. If you are able to make the emergency call from a landline, the emergency services can trace your location. 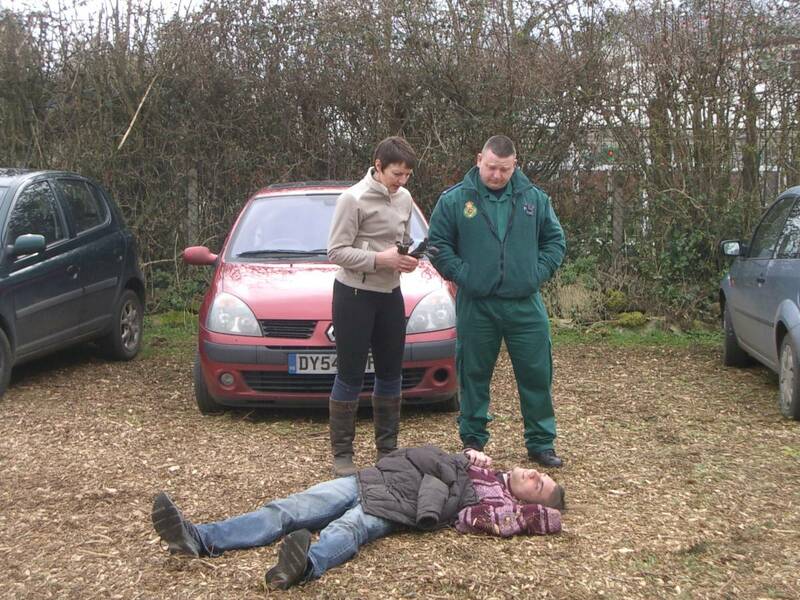 If you are out on a bridleway, you will also need to tell the ambulance crew about access points. The ambulance will try to reach you within 20 minutes, but if you are in an isolated area it could be much longer. Any kind of accident is distressing, and everyone involved could be suffering from emotional shock by this stage. However, you also need to check your patient for signs of clinical shock, which can be fatal. Clinical shock is caused by bleeding, which may not be apparent if the bleeding is internal, so you also need to be able recognise the signs. Is the casualty deteriorating? For example, were they conscious and are now unconscious? Does their skin appear cold, pale and clammy? Does it appear ashen or cyanosed (blue tinted, especially around the lips)? Has their breathing become rapid and shallow? Are they feeling sick or faint? Clinical shock may be delayed by several hours if the bleeding is slow, so whilst you wait, continue to monitor your casualty and ring 999 again to report any changes. “Accidents can happen to anyone,” summarised Jane, “but you can be prepared. Always wear a hat, and a body protector will reduce the risk of bruising. For more information on Cheshire Horsey Coffee Morning events, please visit www.horseycoffeemornings.co.uk. We provide columbia gorge trail rides in the northwest. Thank you for the great article. I have shared this with my staff.